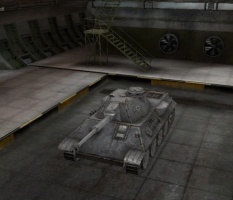 The VK 30.02 (D) is a German tier 7 medium tank. The prototype manufactured in the spring of 1942 was supposed to represent an updated project of Daimler-Benz. It featured a new chassis with torsion-bar suspension and eight support rollers placed in a checkerboard layout. 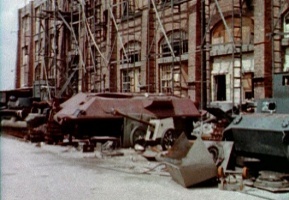 The plan was to mount the Maybach HL 210 P45 engine and the 75 mm KwK 42 L/71 gun on the vehicle. However, the MAN project (future Pz.Kpfw. V Panther) was eventually selected. No prototypes of the Daimler-Benz vehicle were finished. Compared to its predecessor, this tank plays like a true medium, with armour and health to brawl, but less maneuverability. You will want to take advantage of the armour by positioning yourself in such a way that shells will bounce off you. Even with the weight of the armour, the mobility is still a high point. Its gun selection is much like its cousins from the heavy tank lines, the VK 30P or the VK 36H, but a tier late. The 88mm L/56 comes with decent damage potential and it is powerful enough to wake up any sleeping heavy, although the penetration is rather insufficient for its tier, so aiming for the sides and rear is a must. You have some capacity for fighting up-close due to your speed and mobility, but expect to be out-gunned by other mediums. The VK 30.02 (D) leads to the Indien-Panzer. This tank is best used as a flanker, not a sniper like much of the German tank tree. 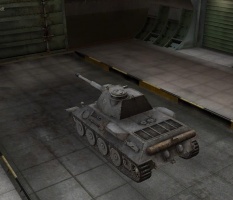 It's very similar to the VK 30.01 (D), but more health and some weight to use. While its guns are very accurate, they are not very powerful for its tier. 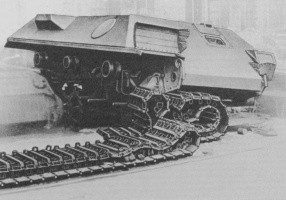 The VK 30.02 (D) counters this by being extremely mobile and somewhat well armored. When at the top of the roster, this tank will easily lead the team to victory. 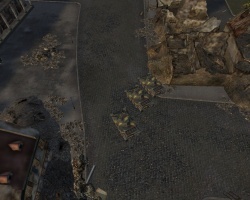 At the middle or bottom of the pack, it should be played in support of higher-tier tanks, taking every available opportunity to break up enemy attacks through flanking and hit-and-run tactics. The second turret is very heavy and slows the tank down. With it and the 8.8cm gun, it starts to play more like the VK 36.01 (H). Unfortunately, since the 8,8cm gun has even less penetration than the 7,5cm, head-on engagements are the last thing you want. It's up to you which you prefer. 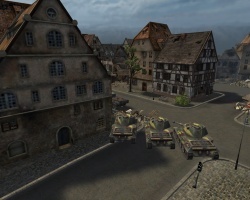 The video Wargaming made for this tank recommends the second turret, but many players prefer to switch back to the first turret. If you use the second turret then try to get behind people, fire a shot or two, and then run behind cover, rather than trying to circle. The 8.8cm gun, while at a serious disadvantage at long range, is very well suited to butchering light tanks and medium tanks at close range. 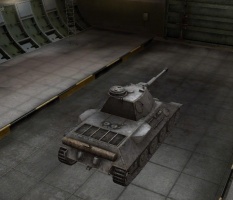 The VK 30.02 D uses this particular gun with the highest reload time, which can be dropped down to 5.2 seconds with the right equipment and skills. You're doing 220+ damage every 5.2 seconds, as opposed to the Comet's 150 damage every 3 seconds or the T-34-1's 250+ damage every 7-8 seconds. This means your damage per shot and reload time is near optimal, letting you get away with constantly exposing yourself to trade fire (assuming you survive the exchange)as well as taking a supporting role and dealing damage from the second line. The 145mm penetration is not an issue when at close quarters since few Tier 5, 6, and 7 mediums have frontal armor that can bounce it. With the impressive mobility of this tank, one can get away with brawling at point-blank range since not many mediums at its tier can trade shot for shot, damage for damage. Fighting Tier 9 medium and light tanks this way is not recommended however, as even ones with poor armor have significantly better guns in terms of penetration and/or alpha damage. For everything else below the 8.8cm will do the trick. With the 7.5cm gun, you're mostly forced back to a flanker-sniper role. You can brawl, but only to a certain limit (for brawling, the 8.8cm is better for the job). If ever you choose to arm the first turret and the 7.5cm gun, play it like you would play a Comet. The radios and guns remain unchanged from the previous tier. You should immediately install a better radio and switch to the 7,5 cm KwK 42 L/70 gun. First research the MB 507 diesel engine for more speed, acceleration, and a lower chance of fire.This engine will cost 17000 exp,don't skip this module,and remember speed is essential for this tank. Next research the upgraded suspension for the necessary weight capacity for the second turret. Now you can research the second turret for improved armor, view range, and the ability to mount the 8,8 cm KwK 36 L/56 gun. 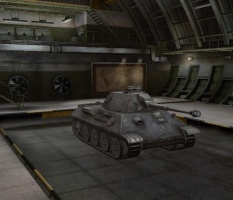 The Panzerkampfwagen V Panther, next to the PzKpfw VI Tiger, is the best-known German tank of World War II. The Panther and the Soviet T-34 are considered to be the best tanks of World War II. When Germany invaded Russia in June of 1941, the Panzertruppe encountered the KV and T-34/76 series-tanks, which were far superior in firepower and armor protection to any Panzer at the time. It was then decided, because of the constant reports from the Eastern Front, to design a new and more powerful medium tank which could be quickly put into production. On November 25th of 1941, Adolf Hitler ordered Wa Pruef start work on the new tank. In December of 1941, Wa Pruef ordered Daimler-Benz and MAN (Maschinenfabrik Augsburg Nuernberg) to design new 30-ton tank armed with the 75mm KwK L/70 gun as a response to the Soviet T-34/76 tank. Rheinmetall-Borsig was in charge of the development of the turret for this new tank. In March of 1942, Daimler-Benz (hence, DB) was the first to produce their version of the VK3002’s design based on previously rejected VK3001 (a direct copy of the T-34/76) designs from January of 1942. Two versions of the VK 3001 with different suspensions were designed by Daimler-Benz; one with spring suspension and the other with torsion-bar suspension. Daimler-Benz's VK3002 design was largely based on the T-34/76 and was more like a modified German version of it. MAN finished their design of the VK3002 in early Spring of 1942. 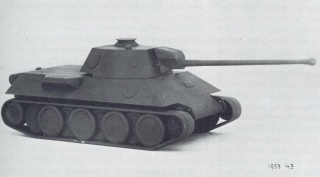 The VK 30.02 (D)’s turret was mounted in the forward position of the hull, just like that of the T-34. A prototype was presented to the Fuhrer, who ordered the production of 200 to start as soon as possible. On May 11th of 1942, the VK3002 project received the designation of Panther. On May 14th of 1942, when extensive tests of both prototypes were completed, Hitler decided to put MAN’s design into production. Daimler-Benz’s design was rejected, since it was assumed that it would cause many problems with identification of the vehicle. It also proved to have poor performance and many modifications would have to be made in order to improve its faults. The Daimler-Benz protototype was captured by the Soviets in 1945. This page was last modified on 25 August 2018, at 00:59. This page has been accessed 24,013 times.